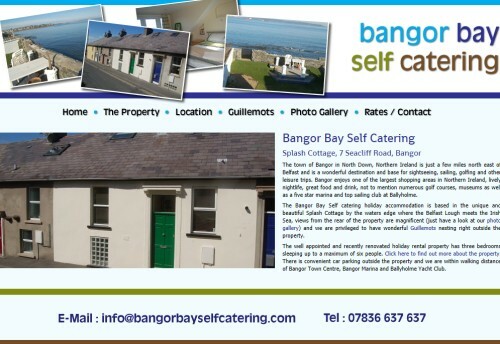 We’ve just completed and launched a website for a unique and wonderfully spacious self catering property on the shores of Bangor Bay. Splash Cottage has been completely renovated in early 2012 and this beautiful and unique three story property is now available for holiday makers in the North Down area to rent. The cottage includes amazing views right over to the county Antrim coastline as well as Scotland if the visibility is good. The proximity of the properly to Bangor Marina and Ballyholme Yacht Club makes it an ideal location for sailors. Visitors will be able to watch the comings and goings of the Guillemots nesting right outside the rear of the property.